“Keep an eye out for John Travolta!” laughs our driver, as we peer out of the taxi window, hoping to spot a warthog or two in the African bush. We are on our way to the swish Shamwari Game Reserve in South Africa’s Eastern Cape, one of the world’s leading luxury safari destinations, and occasional retreat for various species of celebrity. Shamwari has not only won award after award for its conservation efforts and impeccable hospitality record, it has somehow even managed to keep the hordes of the online review community happy. Slightly perturbed by the gushing reviews of the place (one reviewer even claimed to be overcome with tears of happiness when remembering his experience), I have a slight niggle before we arrive that I may not get the rugged and authentic safari experience I’ve been looking forward to. My boyfriend Tony and I arrive at Shamwari with only 10 minutes until our first game drive. Our ranger, Ryan, gives a passionate introduction to the reserve, explaining the rich and diverse ecosystem (which contains five out of the seven South African “biomes”) within a 25,000-hectare malaria-free plot. He asks our newly formed group of six what we’d like to see most and on the face of it seems enthused by our almost collective response – lions. Ryan’s genuine enthusiasm for what he does is matched by the speed at which he drives. We skid down valleys, bounce out of our seatbelts and streak through mud in pursuit of a dot on the horizon. The land is thick with pine bushes, like huge oversized brittle dandelions, positioned against the dense green vegetation and scorched red soil. The bush is vast and stark, and there is a simple pleasure in feeling lost and small within it. Shamwari’s well-managed system, whereby rangers radio each other with key sightings, means that after a couple of drives we’ve been about a metre away from most of the big five. Highlights included: seeing the elephant calf feeding from its mother (a reminder that there really is milk and flesh inside these massive clay units); the agility of the baby rhino (so swift and light of foot I felt I could blow her one-tonne weight over in one breath); and feeling trapped by a leopard’s fixed glare as we intruded on her mating territory (which quickly turned the usual zoo dynamic of “the viewer” and “the viewed” on its head). The natural excitement of being outdoors and on the game drive is amplified by brilliant stage management by the Shamwari staff. We break for lunch in the middle of the bush, to find a table, ready-laid with silver cutlery, champagne and enough fresh food to keep us going for a week. We return from another game drive, bones cold from the wind, to ostrich crudites, hot towels and Decleor facials. The transition between creature and comfort is so seamless you have to remind yourself that it isn’t every day you stop to have a G&T at sundown in a field of impala. Shamwari has luxury accommodation in six lodges, and also offers a back-to-basics option in its Explorer Camp. We’re staying at Bayethe Lodge, described as “luxury tented accommodation”. It is more akin to a Grand Designs thatched house: creatively laid out (a six-metre-high spire roof, freestanding bath and plunge pool), with nice touches (spotlights entwined in branches above our bed, and our pillows arranged like flowers). Evenings alternate between private dinners and group braais (barbecues, with our ranger). At the latter we talk about safaris: the high costs, the pressure on land, the need to control animal numbers to maintain the delicate ecosystem, the push to provide employment to local South Africans. Shamwari is home to indigenous wildlife only, and even at full capacity the reserve accommodates relatively few guests, to ensure the land is preserved and reclaimed as much as possible. Behind the scenes Shamwari also has a breeding centre, an anti-poaching unit, a rehabilitation centre for abandoned or injured animals and an education facility which partners with local schools in the area. Despite the luxury and scale of Shamwari, the rangers are the stars of the show. Ryan’s genuine love of the environment shines through any manufactured feel. His admiration for the whole ecosystem ensures that this is not just a whistlestop tour around the Big Five. We chew spekboom – a succulent known as elephant bush – and understand from its sweet taste why elephants like it so much, we taste aloe, hold dung from black and white rhino in our hands to learn how to spot evidence of the black rhino’s hooked upper lip and “browser” diet. Ryan’s skilled at teaching us to slow down, appreciate whatever comes our way and challenge our own preconceptions of what we will enjoy most. When we go on a trail walk, the dramatic belly of the bush comes to life and for a couple of hours we become part of the landscape. There is a huge variety of birdlife at Shamwari and the trail walk lets us experience the flame-licked wings of the Knysna touraco, the guttural blare of the heron and the orange belly of the Malachite kingfisher. Towards the end of the week the drives become more relaxed. We spend half an hour listening to the melancholy call of the African fish eagle; we opt for watching springbok leaping into the air (pronking) over a rumoured leopard sighting; we track a lion by following her footprints and trying to analyse the behaviour of the antelope that are spread out around her. When we eventually find her we follow her until it gets dark. In our taxi to the airport the driver asks if we saw Prince William or Oprah Winfrey. Despite experiencing all the luxuries that Shamwari has to offer, it’s the first time all week that I’m reminded of my earlier concerns about a sanitized safari experience. • Janette Smith won in the accommodation category in the 2011 competition. 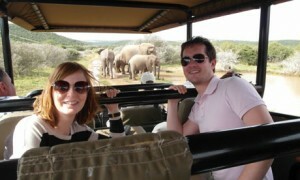 The trip was provided by South African Tourism (0870 1550 044, southafrica.net). It included a stay at Shamwari (shamwari.com, doubles from around ?300) and flights with South Africa Airways (0844 375 9680, flysaa.com). It flies to Port Elizabeth from Heathrow from ?934 return. The tourist board suggests those interested in the country should watch Charley Boorman’s South African Adventure, which will be broadcast on Channel 5 in early 2013. This entry was posted in The best hotels news and tagged Africa. Bookmark the permalink.